If implemented, the restrictions might make it impossible for Norwegians and Finns, as well as outside Russians, to visit the two border towns and adjacent areas, without special permission. «Having reviewed Your request, the Administration of the Pechenga Rayon does not have any objections against the proposed extension of the border zone under the condition that Russian legislation with regard to the residency and free movement in the zone of the local population is not violated», a letter from the municipal government reads. The letter from Pechenga Administration to the Murmansk regional Security Committee. 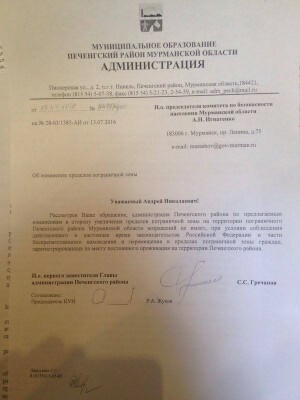 The letter is signed by Ruslan Zhukov, Acting First Deputy Head of the Pechenga Administration, and addressed to Andrey Ignatenko, deputy head of the Murmansk regional Security Committee. It was signed on 13th July this year and became public after Bloger51 published a copy of it. The letter shows that local authorities express their consent with the proposed extension of the border zone. The Barents Observer has not been able to get a comment from the Pechenga municipal administration on the issue. FSB Border Guards in Murmansk writes in a response that the question is for FSB Border Guard in Karelia to answer. The FSB headquaters in Petrozavodsk is in charge of Russia’s northern landborder to Finland and Norway. Karelian FSB has not responded to questions from the Barents Observer on the issue. In a comment to newspaper SeverPost, regional Governor Marina Kovtun underlines that she is against the closure of the Pechenga municipality. «For many years, we have been developing cross-border cooperation, this is not what we have been working for», she says. The Government of Marina Kovtun has actively strengthened relations with neighboring Norway and Finland. Every year, Murmansk hosts several international events in the area, among them the annual Border Days. The positive dynamics in local cross-border cooperation have been spurred by the successful introduction of visa-free Local Border Traffic in year 2012. Norwegian border officials are not informed about the suggested border zone extension. 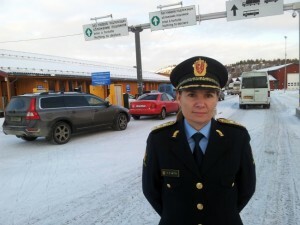 «No, we are not aware of such plans,» says Chief of Police in Finnmark, Ellen Katrine Hætta to the Barents Observer. Last autumn, some 5.500 migrants came across the border to Norway. The flow of of refuges and migrants on the Arctic route through the Pechenga region suddenly stopped on November 30th. The migrant flow then turned towards Finnish Lapland where more than 1.000 migrants crossed the frontiers before they also there suddenly stopped coming on February 29th. Since then, not one single asylum seeker has crossed the borders from Russia’s Kola Peninsula to either Norway or Finland. Russia’s internal border zone has over the years been revised several times, and included both the actual border zone (pogranichnaya zona) and the so-called near-border zone (prigranichnaya zona). In the 90s and 2000s, a checkpoint at Titovka marked the near-border zone, and people needed to show passport before continuing further. Non-Russian citizens not holding a Norwegian passport or legal entry documents to Norway could here risk being stopped. 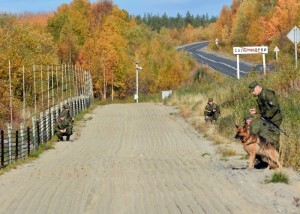 Until 2010, FSB could deny foreigners to enter the near-border zone, including to the towns of Nikel and Zapolyarny. Traffic in transit from the border to Murmansk along the E105 / M18 main road was only allowed three days in the week for all foreign registered vehicles. In a period, Norwegians even needed a special permission issued by FSB border guards to make stopovers in Nikel or Zapolyarny. Then, in the period from 2012 to late autumn 2015, the Titovka checkpoint allowed most people through and there were few restrictions on movements for foreigners. Norwegians can freely travel in Pechenga, except the military closed areas. In the border zone, outside the barbed wire fence and towards the actual borderline to Norway, people are only allowed in transit on the road if their papers allow them to cross the border to Norway. Researcher Arild Moe with the Fridtjof Nansen Institute in Oslo believes the flow of migrants in the border regions on the Kola Peninsula likely has strengthened FSB’s desire to take a few steps back from the liberalization of the border regime seem over the last few years. «I believe FSB has been against the liberalization of the border regime, particularly since 2012, but other concerns have until now carried more weight. The influx of migrants in the border region in the autumn of 2015 has likely strengthened the position of FSB,» says Arild Moe to the Barents Observer. 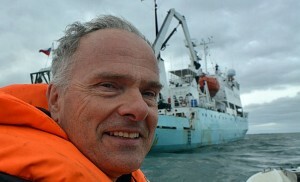 Moe has recently co-authored an article with Lars Rowe analyzing Russia’s role in last year’s Arctic migrant flow. “Asylum stream directed by crime elements"